Los Angeles County Sheriff's Department - West Hollywood Station advises you to AVOID Fountain Ave. & Kings Road, WHD due to a current traffic issue. 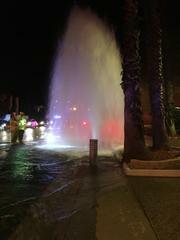 Two vehicles had crashed near Fountain Ave. and Kings Road severing a fire hydrant. Fountain Ave. is closed b/t Flores St. and De Longpre Ave. and will require a detour of traffic for the next hour.